1990-02-06. New. Ships with Tracking Number! INTERNATIONAL WORLDWIDE Shipping available. Buy with confidence, excellent customer service! 2001-05-06. New. Ships with Tracking Number! INTERNATIONAL WORLDWIDE Shipping available. Buy with confidence, excellent customer service! 1985-04-08. Good. Ships with Tracking Number! INTERNATIONAL WORLDWIDE Shipping available. May not contain Access Codes or Supplements. May be ex-library. Shipping & Handling by region. Buy with confidence, excellent customer service! Anchor, 1990-02-01. 1st Anchor Books. Paperback. Used:Good. Dodd Mead, 1985-10-01. Hardcover. Used:Good. Anchor. PAPERBACK. 0385411499 New Condition. . New. Dover Publications. PAPERBACK. 0486418790 New Condition. . New. Dodd Mead. Hardcover. 0396083854 New Condition. . New. 1990-02-06. Good. Ships with Tracking Number! INTERNATIONAL WORLDWIDE Shipping available. May not contain Access Codes or Supplements. May be ex-library. Shipping & Handling by region. Buy with confidence, excellent customer service! 2001-05-06. Good. Ships with Tracking Number! INTERNATIONAL WORLDWIDE Shipping available. May not contain Access Codes or Supplements. May be ex-library. Shipping & Handling by region. Buy with confidence, excellent customer service! New York: Anchor. 1990. First Edition; First Printing. Softcover. 0385411499 . Very Good in wrappers. ; From the collection of Marlene and J. Billy VerPlanck. ; 470 pages; All domestic orders shipped protected in a Box. .
Dodd Mead. Hardcover. 0396083854 Like New Condition. . Fine. Dover Publications. PAPERBACK. 0486418790 Like New Condition. . Fine. Anchor. PAPERBACK. 0385411499 Like New Condition. . Fine. Dodd Mead. Used - Acceptable. Shows definite wear, and perhaps considerable marking on inside. Dodd Mead. Used - Good. Shows some signs of wear, and may have some markings on the inside. Dodd Mead. Used - Good. Ships from the UK. Former Library book. Shows some signs of wear, and may have some markings on the inside. 100% Money Back Guarantee. Your purchase also supports literacy charities. Dodd Mead. Used - Very Good. Ships from the UK. Former Library book. Great condition for a used book! Minimal wear. 100% Money Back Guarantee. Your purchase also supports literacy charities. Dover Publications, 2001-07-18. 3rd. Paperback. Used:Good. New York: Dodd, Mead and Co., 1985. First edition, as stated. Hardcover. Very Good/very good. 6 x 9 in. Paper boards. Signed by Berger on ffep. Condition is VERY GOOD ; corners and spine ends bumped, edges sunned. Binding tight, text unmarked. DJ is VERY GOOD ; sunned, edges chipped. Mus. Stax. Dover Publications. PAPERBACK. 0486418790 Special order direct from the distributor . New. Dodd Mead. Hardcover. 0396083854 Very Good- An excellent copy. Hardcover. SIGNED by Author with a personalized inscription: "To Herman Med?," Stated First Edition. Indication of a later printing not present, no number line. Pages sharp and clean. No marks or highlighting in text. Cover corner tips bumped. Light wear to edges of dust jacket. Spine is lightly faded from the sun. This book has NOT been marked as a remainder by the publisher. Price on dust jacket is intact and has NOT been clipped. Accurate Detailed Descriptions with Fast Shipping and Robust Packaging. GRY145H . Very Good. Dover Publications. PAPERBACK. 0486418790 *LIKE NEW* Ships Same Day or Next! . Fine. Dover Publications. PAPERBACK. 0486418790 *BRAND NEW* Ships Same Day or Next! . New. Dover Publications. PAPERBACK. 0486418790 . New. Dover Publications. PAPERBACK. 0486418790 Remainder mark . Fine. Dodd Mead, September 1985. Hardcover. Used - Signed. Very nice clean, tight copy free of any marks. New York: Anchor Books / Doubleday, 1990. 5/25/2011. Near Fine. Reprint. 470pp. Trade paperback. Near fine with creases to front cover, edge wear. 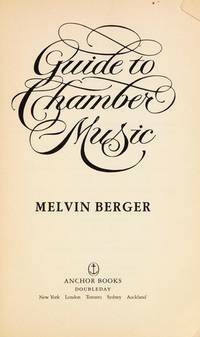 A listener's guide to chamber music, including a directory of composers and their compositions. Very Good. 1st.ed.Clean tight copy without dust jacket.Fine. London: Robert Hale, 1986. First UK Edition. Octavo: VG/VG: Blue/multi spine with off white text: DJ has general shelfwear, one inch closed tear along head edge, original price sticker on back: Boards are strong and clean with mild general shelfwear, binding is tight: Textblock is clean and pages are free of markings, folds or tears: First UK Edition: 470 pp. Shelved Rockville Bookstore. Dover Publications, 2001-07-18. Paperback. Good. Dodd Mead, 1985-10. Hardcover. Good. New York: Dover, 2001. 461pp. Wear wraps; tear bottom of rear cover.. Reprint. Paperback. G+. Anchor Doubleday. 1st printing thus,1990. Very Good- soft cover. 12mo,soft covers,470pp. edgewear,rubbing,corners curled,crinkle line spine,cover. corners bumped,text tanning,clean and tight. music. Anchor. Used - Good. Shows some signs of wear, and may have some markings on the inside. Find out why millions of customers rave about Better World Books. Experience the best customer care and a 100% satisfaction guarantee. Robert Hale Ltd, 1986. This is an ex-library book and may have the usual library/used-book markings inside.This book has hardback covers. In good all round condition. Dust Jacket in good condition. Dover Publications, Incorporated, 2001. Paperback. Very Good. Disclaimer:A copy that has been read, but remains in excellent condition. Pages are intact and are not marred by notes or highlighting, but may contain a neat previous owner name. The spine remains undamaged. At ThriftBooks, our motto is: Read More, Spend Less.Dust jacket quality is not guaranteed. Anchor. Used - Acceptable. Ships from Reno, NV. Former Library book. Shows definite wear, and perhaps considerable marking on inside. 100% Money Back Guarantee. Shipped to over one million happy customers. Your purchase benefits world literacy! Anchor. Used - Acceptable. Former Library book. Shows definite wear, and perhaps considerable marking on inside. Anchor. Used - Good. Ships from Reno, NV. Shows some signs of wear, and may have some markings on the inside. 100% Money Back Guarantee. Shipped to over one million happy customers. Your purchase benefits world literacy!